Retro 51 Buzz Rescue Ballpoint Pen Review and Giveaway! Welcome back to another Review and Giveaway! Retro 51 has recently released a new addition to their Rescue Pen line: the Retro 51 Buzz Rescue Ballpoint Pen. Retro 51 is great about supporting charities and other non-profit organizations who bring about good. Each pen in the Retro 51 Rescue pen line has a generous portion of all sales donated to a charity or non-profit organization for the Rescue of those animals. 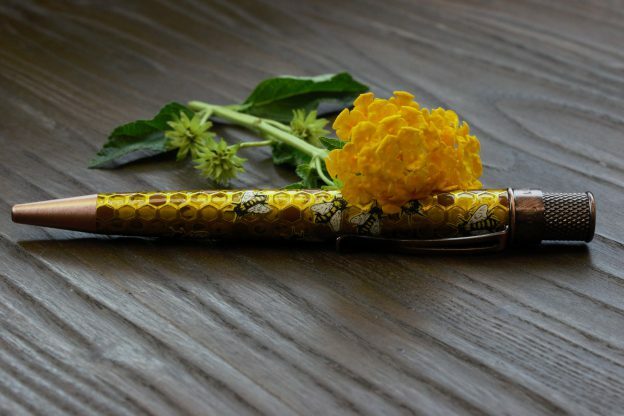 A portion of all sales from the Buzz Pen goes to support the NW Honey Bee Habitat Restoration. There has been quite a lot of talk about the Buzz Pen, so we’re bringing you this review so that you can know what the buzz is all about. The Buzz Pen has antique copper trim, as well as an antique copper clip. The clip and trim pair nicely with the golden “honey” yellow of the barrel. 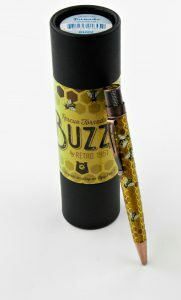 The Buzz Pen comes with an acid etched honeycomb texture along the barrel, which gives the pen a great tactile feature. Honeybees have been printed onto the barrel to look as though they are busy making honey. The pen also features a whimsical bear atop the finial of the pen. The Retro 51 Buzz Rescue Ballpoint Pen comes in a bee themed protective tube casing. Also, the protective tube doubles as a pen stand for your pen! Inside the tube you will find foam padding where the pen rests, and some reading material from Retro 51. The Reading Material includes a Use and Care Guide, as well as an explanation about what the NW Honey Bee Habitat Restoration plans to do with the donations. Included in the Buzz Pen is a Retro 51 Easy Flow 9000 Ballpoint Refill. The Easy Flow 9000 is a great refill that writes reliably and smoothly. However, any Parker-style refill or Schmidt Short Capless rollerball refill will also fit into the Buzz Pen. The Retro 51 Buzz Rescue Ballpoint Pen is a great pen for a great cause. The dwindling population of the honeybee is something that effects us all, and this is one way we can all do something about it. If you would like to know more about the NW Honey Bee Habitat Restoration, please visit their site via the preceding link. Don’t forget to enter the giveaway below before this Buzz is Lightyears away! This entry was posted in Ballpoint Pens and tagged ballpoint pen, Giveaway, Retro 51 on June 22, 2018 by Pen Chalet. What a great idea! Anything to help animals and particularly bees is a wonderful thing not to mention this pen is gorgeous! This might be my favorite of their new releases! Such a stunner. These pens are so pretty! I’ve never had a Retro51 so I’d love to see if they live up to the hype. The design is super cute, I’m digging it! This pen is so cute, love it! I don’t usually use ballpoints, but this one looks neat! A good cause too! I love my retro 51 Tornado Black Titanium!! I would love to add the Buzz rescue to my collection!!! I love Retro 51 pens, for when I don’t use a fountain pen! This one in incredibly cute … and for a good cause! Fun design, and potentially useful for finger-fiddlers like myself too (anyone else looking at that acid etching?). Nice container too. I have a beekeeper friend who would love this! I think this is just about the best Retro 51 I’ve seen. I love the texture, and the cause, and the overall awesomeness. I’m really taken by the textured honey-comb! I need to finally try a retro! This pen is so adorable and I love what it stands for! Probably my favorite Retro! Really love this one! And it’s for a fabulous cause. Perfect. This is my favorite retro 51 yet!!! Just wish it was rollerball. Love! I have been intrigued by Retro 51 pens, and the buzz rescue pen may tilt the scales. Thanks for a chance to win! What a good looking Retro51. I still don’t have any and am considering this as my first! Life’s to short NOT to carry a Buzz pen. Retro 51 continues to produce cool pens, and many retailers are sponsoring wonderful versions. I appreciate that this pen supports an important cause, and also that the finish has texture to it. I usually only buy and use fountain pens, but considered getting a nice ballpoint/rollerball for times I can’t use a fountain pen. This bee one I would definitely buy. I love bees and used to keep bees, even though I don’t care for honey (except straight out of the hive). I also really like the copper accents. I have a soft spot in my heart for bees! I would love this pen. Retro 51s are about the only non-fountain pen I use any more. Really would like to win this for my hubby and his hives! I have a friend who’s a beekeeper who would love this pen. What a great cause and cute design! I’m a strictly fountain Pen person but this Retro 51 is the “Bees Knees” as my Mom used to say when something was really cute!! Thank you for the giveaway! God Bless & Love You Bunches!!! This is a great looking pen and for such a good cause. I have only been interested in bees and beekeeping since last year so for this to come out is lovely! Bees reminder me of one of the loveliest ladies I ever met, who happens to live in the northwest and cherished her hives. I am glad to see that Retro branches out, produces pens for everyone, and cares to support organizations by doing what they do best. I cannot wait to have this one in my collection! I’ve never had the pleasure of trying a Retro 51. This would be a fun one to try. Nice! Anyone can put a mason bee house in their yard. Really love this pen and especially the charity. As an owner of a chow chow that looks like a little bear, I really love the bear on the end. Always fun to see what Retro comes up with, and a worthy cause to boot. What a neat looking pen, the copper accents and the yellow body look so nice together! Love everything retro and this is gorgeous! Retro 51 does it again! This is one of the most beautiful Retro 51’s yet! Very interesting design. I’m following bee populations around the globe and have been for a couple years now. I could imagine this pen being a great conversation starter, about my own hobby and maybe the bee population issues as well. Retro 51 pens are the best!